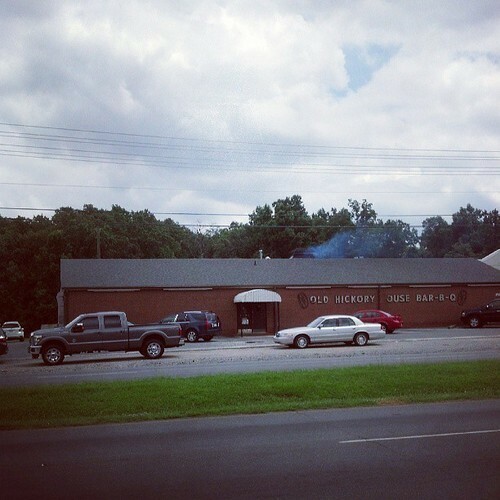 In our review for Bill Spoon’s Barbecue, I stated that it is “pretty much the closest thing we have to a well-respected, old school barbecue joint.” Well, I may have misspoke a little bit because Old Hickory House Restaurant has been doing its own thing at its current location on North Tryon Street since 1956, 7 years before Bill Spoon’s even opened. 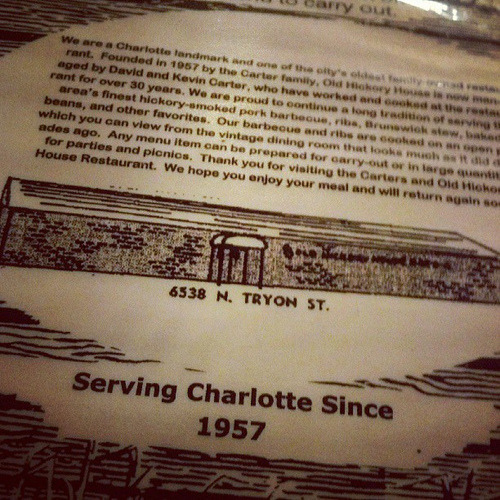 Despite its proximity to NoDa, it had actually been a number of years since I had eaten here. However, despite not remembering loving it at the time I was interested to see how it would stack up to the other Charlotte joints we have reviewed recently. 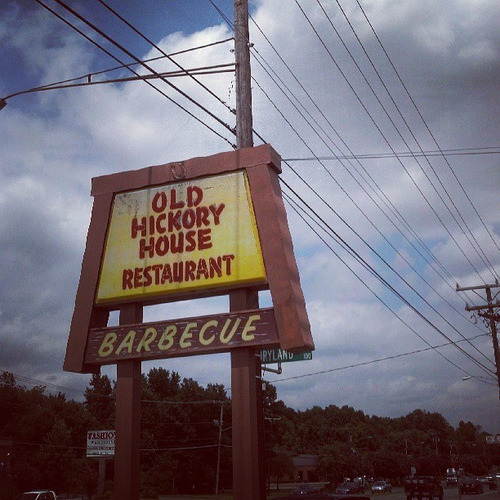 In addition to its age, Old Hickory House does have a couple of things going for it – namely a wagon wheel-chic decor that looks like it hasn’t changed since it opened as well as the fact that you can see and smell the hickory smoke as soon as you open your car door in the parking lot. 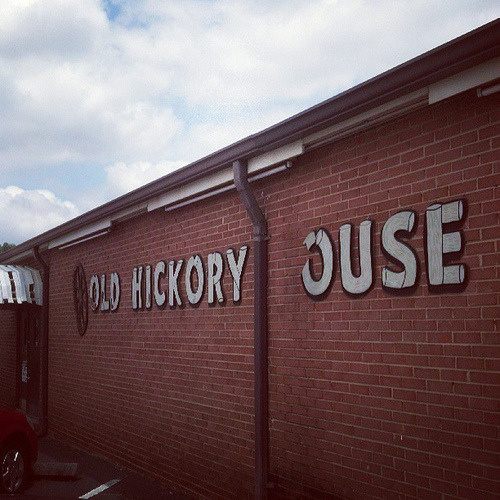 Inside, I sat myself and ordered a very good sweet tea from the waitress (who has apparently been there for 15 years) and then a small pork plate with slaw and hush puppies. While waiting for my food, I couldn’t help but notice the small wood burning pit open for the entire dining room to see. 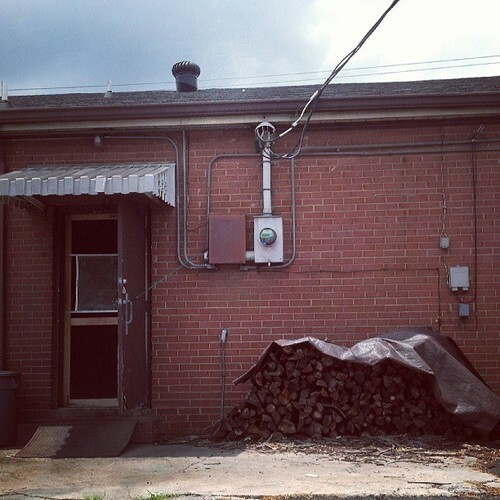 I confirmed with the owner David Carter after my meal that he does cook over hickory logs and then also drove around back afterwards to check out the pile. So you see, its not just a clever name. The meal comes quickly and one thing I hadn’t remembered was the side of Texas toast, a bit unusual for North Carolina. But ah, you see, this actually isn’t a North Carolina-style joint. 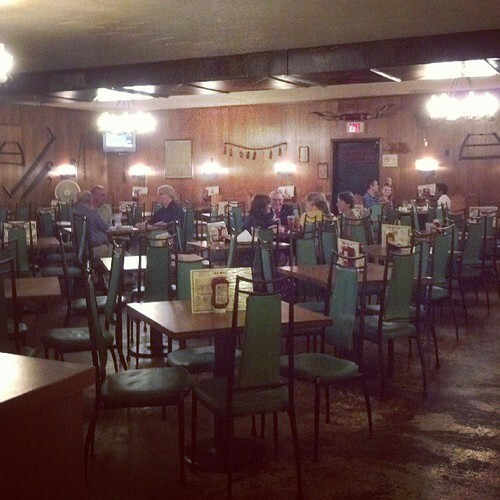 According to Bob Garner’s Big Book of Barbecue, the Carter Family (who opened the restaurant in the 50’s and still run it today) has roots in Georgia and Alabama. 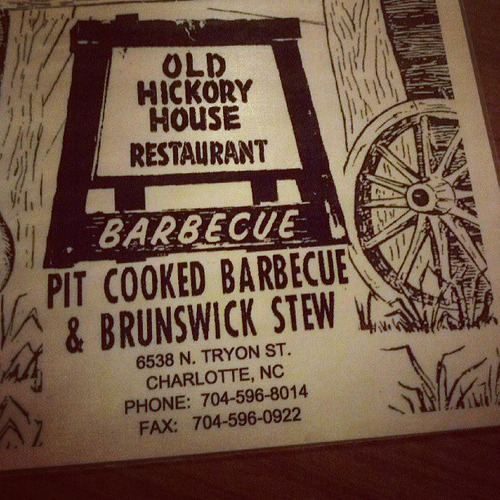 So while you can order Brunswick stew, it won’t be North Carolina style. And while the slaw is mayo-based similar to eastern-style slaw, it contains dill instead of the normal pickle that eastern and Lexington have. And then you have the pork. The pork itself is actually quite good, more minced than chopped and full of bark and smoke and moistness. But it is smothered in this peculiar reddish-brown barbecue sauce after it is spooned onto the plate which is a bit citrusy and tangy and unlike any sauce I’ve had before. And unfortunately, it isn’t really for me. I would have loved to have had the pork without the sauce (because from what I could tell it was really good) and if I ever go again I may ask for it on the side to use sparingly. 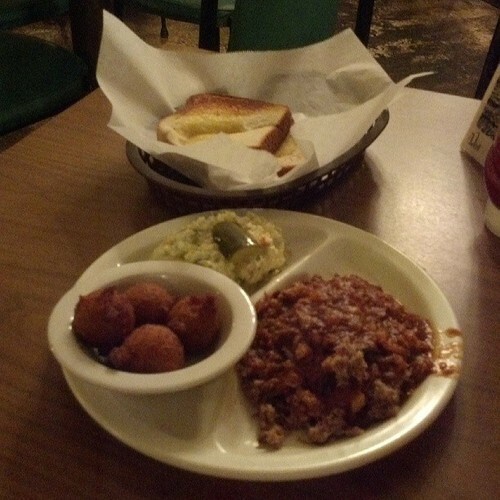 The hush puppies were excellent and the slaw was pretty good. And I was fairly hungry so I ate the two slices of Texas toast provided. All in all, not a bad meal at all. 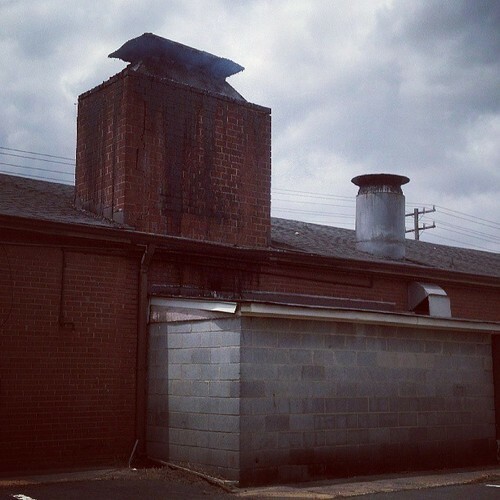 Just not the style of barbecue I usually prefer.